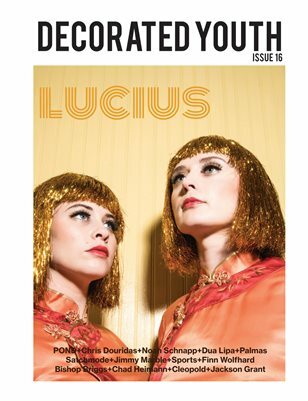 Our sixteenth issue features an interview with the music group Lucius as well as interviews with; Satchmode, Chad Heimann, Bishop Briggs, Cleopold, Jackson Grant, Palmas, Chris Douridas, Sports, Noah Schnapp, Finn Wolfhard, Dua Lipa, POND, and Jimmy Marble. We have music photo galleries of; Tame Impala, Julien Baker, Blood Orange, Alex G, Young The Giant, Cleopold, Tegan & Sara, Moses Sumney, James Blake, All Things Go Fall Classic, Hit The Lights, Simple Plan, Beach Fossils, The 1975, Catfish & The Bottlemen, Beach Goth Festival, Two Door Cinema Club, The Japanese House, The Lemon Twigs. Twin Peaks, and Iceage. In our Venture Out series we feature galleries of; Venice, Berlin, Copenhagen, Korea, and NYC.